Soil erosion is the process of detachment of soil particles from the parent body or disturbance of the soil structure is known as soil erosion. Generally soil erosion is called as the creeping death of the soil. Soil erosion is considered as negative soil pollution. Soil is the weathered superficial layer of the earth crust supporting growth of plants. Soil serves as reservoir of nutrients and water for crops, provides mechanical anchorage and favourable tilth. The components of soils are mineral material, organic matter, water and air, the proportions of which vary and which together form a system of plant growth. The top layer of the soil is the vital component, since all the nutrients required by plants is present in this layer. The top layer therefore is said to be the feeding zone of plants. This fertile top layer of the soil is most valuable natural resource and is generally lies at a depth of 15 to 20 cm. 1. Land use changes involving destruction of forests and grasslands for expansion of agriculture and other commercial activities. 3. Fallowing of land for a longer duration. 4. Overuse of chemical fertilizers under intensive cultivation practices destroys the soil structure consequently the soil becomes susceptible to erosive forces. 5. Shifting cultivation by tribal population. 6. Continuous cultivation of the same crop. Soil erosion is of various types. However, based on the rate at which soil loss takes place, there are two main types of soil erosion. 1. Geologic erosion: It occurs under natural conditions by itself without any interference of man. It is very slow process and state of balance between loss and build up is hardly lost. 2. Accelerated soil erosion: This type of soil erosion is very rapid and never keeps pace with the soil formation. This is most serious type of loss, generally caused by an interference of an agency like man and other animals. Depending on the agents of erosion, soil erosion is called as water erosion or wind erosion. 1. Water erosion: It is caused by the action of water, which removes the soil by falling on as rain drops, as well as by its surface flow action. The characteristic soil losses are sheet erosion, rill erosion, gully erosion, ravines, landslides or slip erosion and stream bank erosion. (i) Sheet erosion: It is least conspicuous and is first stage of erosion. In this type of erosion soil is removed uniformly like a thin covering from large area. (ii) Rill erosion: When the runoff starts, channelization begins and erosion is no longer uniform. Incisions are formed on the ground and erosion is more apparent than sheet erosion. This is the second stage of erosion. (iii) Gully erosion: The results due to convergence of several rills towards the steep slope, which form together wider channels (grooves) of water known as gullies. 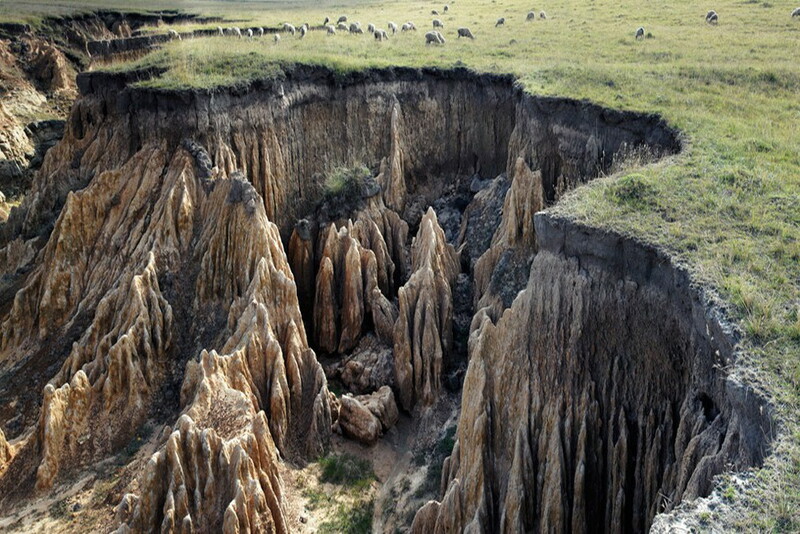 Gullies are the most spectacular symptoms of erosion. If unchecked, cultivation becomes difficult. (iv) Ravines: These are manifestation of a prolonged process of gully erosion, typically found in large expanse of deep alluvial soils. They are deep and wide gullies and their formation indicates very advanced stage of gully erosion. (v) Landslides or slip erosion: Landslides occurs in mountain slopes. The hydraulic pressure caused by heavy rains increases the weight of the rocks at cliffs which come under the gravitational force and finally slip. In this type of erosion water and gravity works together. Generally landslides cause blockage of the traffic on roads. (vi) Riparian erosion: This type of erosion takes place on the banks of fast running rivers. Here the surface current cuts the margin of the bank laterally. Once much of the soil from beneath is cut away, the top soil of the river banks tumbles down into the water with big splash. This type of erosion is also known as stream bank erosion. 2. Wind erosion: Soil erosion by wind is common in arid and semi-arid regions where the land is bare and devoid of vegetation or soil is sandy and the vegetation is poor and sparse. Overgrazing in these areas exposes soil to wind erosion. Saltation, suspension and surface creep are the types of erosion caused by wind. (i) Saltation: Saltation is the first stage of movement of soil particles in series of jumps. In arid zone where rainfall is scanty, drainage is poor and high temperatures prevail, water evaporates quickly leaving behind the salts. The major portion of such salty soil is carried out by wind in the form of small leaps which is caused by direct pressure of wind on small particles of soil. Soil particles jump up vertically into air and rise to a height of 30 to 60 cm and fall through the air. Generally 50 to 75% of the weight of soil lost by wind erosion is carried in saltation. (ii) Suspension: Floating of fine dust particles through the air is known as suspension. The particles are smaller than 0.1 mm in diameter. Generally 3 to 4 % of the weight of soil lost by wind erosion is carried in suspension. (iii) Surface creep: The heavier particles larger than 0.5 to 3 mm in diameter that are not easily thrown up by wind are simply pushed or spread along the surface by wind. Generally 5 to 25% weight of the soil lost by wind erosion is carried in surface creep. The topsoil removed by wind and water ultimately comes to rest as sediment. Erosion is the major cause of upset of the ecosystem at the point of sedimentation as the eroded materials are rich in chemical fertilizers and pesticides. Soil erosion causes siltation of rivers, lakes and dams. Silt chokes estuaries and harbours. Eroded soil is deposited on riverbeds, raising their levels and leading to devastating floods. Eroded sediment usually is the richest part of the soil, the nutritive topsoil containing most of the organic matter. Thus it leads to land degradation and to decline in its productivity. Soil erosion also accelerates aridity and lowers the level of sub-soil water. Uncontrolled wind erosion owing to deforestation leads to decline in rainfall. One of the probable reasons why moisture-laden clouds pass over Western Rajasthan without precipitating is fine dust suspended in the air over the desert. This dust is, indeed, the direct result of wind erosion caused by deforestation. 5. Reduction in wind velocity near the ground by growing vegetation cover, ridging the land etc. 6. To grow strips of stubble or other vegetation cover which might catch the moving particles of soil. 1. Agronomic measures: Agronomic measures include contour cultivation, tillage, mulching, crop rotation, strip cropping, trash farming, cover crops and dry farming practices. Soil erosion can be controlled by these methods when the slope is gentle i.e. less than 2 %. When these methods are used in combination, erosion can be reduced even if the slope is more than 2%. (i) Contour cultivation: Contour cultivation includes contour ploughing, contour sowing and other intercultural operations. By ploughing and sowing across the slope, each ridge of plough furrow and each row of the crop act as an obstruction to runoff, providing more opportunity for water to enter into the soil and reduce soil loss. Contour cultivation is a very simple practice and can easily be practiced. (ii) Tillage: Tillage is opening of soil for seed bed preparation. The tillage is distinguished into conventional tillage and conservational tillage. Conventional tillage includes ploughing twice or thrice by harrowing and planking. It leaves no residues on the soil surface. Conservation tillage is disturbing the soil to the minimum extent necessary and leaving crop residues on the soil. Conservation tillage practices which include zero tillage and minimum tillage can reduce soil loss up to 99% over conventional tillage. In most cases, conservation tillage reduces soil loss by 50% over conventional tillage. (iii) Mulching: It refers to covering the soil with plant residues. It is effective against wind as well as water erosion. Mulches reduce soil moisture evaporation and increase amount of soil moisture by addition of organic matter to soil. (iv) Crop rotation: It refers to alternate growing of crops. It decreases soil loss and preserves the productivity of land. The growing of same crop year after year depletes the soil minerals. Use of legumes in crop rotation maintains the fertility of the soil. (v) Strip cropping: It is a system of crop production in which long and narrow strips of erosion resisting crops (close-growing crops) are alternated with strips of erosion permitting crops (erect-growing crops). The strips are laid across the slope. Strips of close-growing crops reduce the transporting and eroding power of water by forming obstruction to run off and filter out the soil from the runoff and retain it in the field. (vi) Trash farming: It is a technique of soil conservation where chopped crop residues are spread and ploughed in order to produce a better tilth in the soil. (vii) Cover crops: Cover crops are the crops grown to cover the soil during off-season. Certain cash crops like peanuts cotton, soyabean etc. do not produce enough residue to provide adequate ground cover. Cover crops usually legumes are used to provide the needed protection against erosion and also add nitrogen to soil. (viii) Dry farming: This practice is useful for croplands grown in low and moderate rainfall areas, where ordinary farming is at risk. Crop production, animal husbandry and growing grazing fields are the only possibilities of checking erosion. Some of them are land fallowing, strip-cropping, crop rotation etc. 2. Chemical measures: Breakdown of aggregate by the falling rain drops is the main cause of detachment of soil particles. Soils with stable aggregates resist break down and thus resist erosion. Aggregate stability can be increased by spraying chemicals like polyvinyl alcohol at 480 kg/hectare, the rate, however, depends on the type of soil. Soils treated with bitumin increase water stable aggregates and infiltration capacity of soil. 3. Mechanical measures: The mechanical measures are adopted to supplement the agronomical measures when the later alone are not adequate. These measures include Basin listing, Sub-soiling and Contour terracing. (i) Basin listing: It is constructing of small basin along the contours to retain water which also reduces its velocity. It is especially effective on retentive soils having mild slopes. (ii) Sub-soiling: This method consists in breaking with a subsoiler the hard and impermeable subsoil to conserve more rain-water by improving the physical condition of a soil. This operation promotes greater moisture penetration into the soil, reduces both run-off and soil erosion. (a) Channel terrace: to dig channels at suitable intervals and the excavated soil deposited as a wide, low ridge along the lower edge of the channel. (c) Bench terrace: to construct a number of platforms along contours or suitable graded lines across the slope. 4. Forestry measures: Afforestation of eroded lands is best method of erosion control. The standing vegetation and dried leaves on the floor intercept the rain and reduce the impact of rain drops. Thus averting the erosion process. Moreover, the decomposition of fallen dead plant parts i.e. leaves and twigs not only increase the fertility of the soil but also improve the soil structure, which resist the soil erosion. (ii) Retiring lands to grasses: It involves to grow grasses on such lands where major proportion of the top soil has been eroded. Generally grasses are allowed to grazing under suitable climate conditions. (i) Gully control: To check the formation or widening of gullies by constructing bunds, dams, drains or diversions through which excess run off water is channelled. (ii) Stream bank protection: To grow vegetation alongside the river bank, to construct drains, concrete or stone pitching etc. For checking the cutting and caving of river banks.